The following information is designed to provide helpful facts so you can make an informed decision as to whether dental implants are right for your situation. 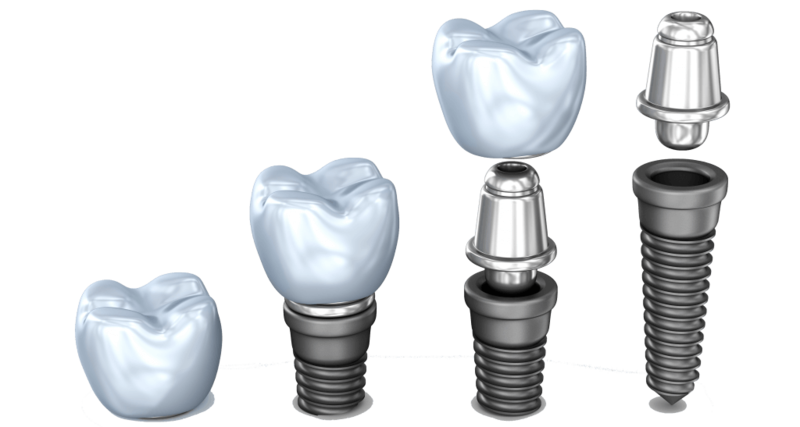 The key benefit of dental implants over other tooth replacement systems is that an implant connects directly to the jawbone. It’s obviously not the same as the original connection, but functions just the same. When a tooth is lost, bone loss will eventually occur in that region because the root is no longer stimulating and stabilizing the bone. By using titanium (which biochemically joins to bone) to replace the root, you get a bond that more accurately replicates the one found in nature. Besides causing damage to the immediate area, tooth loss affects remaining teeth as well. Teeth create a structure for the face and their loss can shift the surrounding teeth, creating aesthetic issues and bite problems. A lost tooth can also affect facial structures such as the jaw, muscles, jaw joints, and even the skin. If several teeth are lost, it’s not uncommon to suffer from social consequences and poor nutrition. When the supporting alveolar bone melts away, it’s gone for good, but a skilled dental professional can recreate bone to fuse with and support an implant through grafting. This is wonderful news, but it is still best to have a dental implant as soon as possible after the tooth is lost for the most predictable aesthetic outcome. 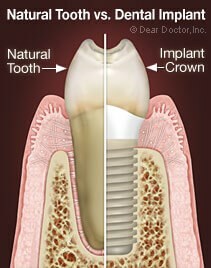 Replacing a tooth with an implant and a dental crown is not a one-day procedure. The implant needs time to properly adhere to the bone and create a healthy fusion before the crown can be attached and full bite force can be applied. In most cases, it will take a few months to complete the process. Due to the timeline, dental implants are actually a series of steps; each is very different and may require an individual specialist. The best place to start is with an AACD member dentist. A dental crown, bridge, or denture can all be used in combination with a dental implant to replace missing teeth. The type of restoration used will be determined based on the number of missing teeth. AACD dentists are highly qualified to design custom restoration that look and feel like natural teeth for an aesthetic result. When the implant post fully heals and fuses with the bone, about 2 – 3 months after surgery, an abutment is used to secure the final dental restoration. 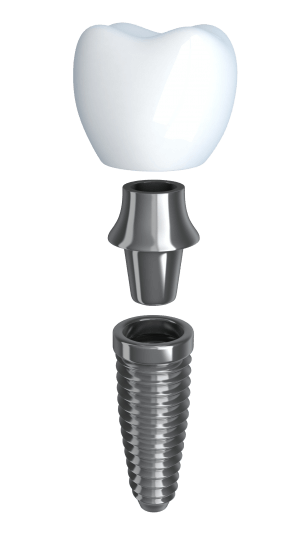 A small threaded screw, the implant post is made from biocompatible titanium. The implant post will be strategically and surgically implanted into the jaw bone. The post acts as a prosthetic root, and will naturally fuse with bone creating a lasting bond. Dental implants for missing teeth provide exceptional aesthetic results. Made from high-quality dental materials, dental implants look function and feel like just like your natural teeth. Dental implants can be used to replace a single missing tooth or to secure a bridge or denture for replacing multiple missing teeth. Your local AACD dentist may provide dental implant services or implant secured dental restorations for beautiful results. If you are missing teeth, dental implants are the most natural way to replace them. AACD dentists are highly trained in creating dental restorations that blend seamlessly with your smile. High-quality dental porcelain is used to create a customized dental restoration that will be supported by the surgically implanted dental implants. Your AACD dentist will work with you to design a dental crown, bridge, or denture that will improve the appearance of your teeth for a confident smile you feel proud to share. Using dental implants to secure a dental restoration for missing teeth can improve the appearance of your smile. Traditional dentures can appear too big, bulky or loose. Dentures can slip while eating or speaking causing embarrassment. Patients feel self-conscious of their smile, and hide their teeth behind their lips or hands. Dental implants provide added bite stability and support long-term oral health. Implant secured dentures help stabilize the jawbone. Missing teeth can lead to facial sagging and premature aging. Without the support of the tooth root, the jaw bone begins to break down. As the jawbone weakens, the facial structure can become compromised. Patients with missing teeth often see a gradual shifting of their jawline. Dental implants stimulate natural bone regeneration and prevent the deterioration and regression of the jawline. Implants are surgically implanted into the jaw and help to support the structure of the face and bite. Replacing missing teeth with dental implants can prevent facial sagging and help to make patients look and feel younger.